The official CNET review (available here) of the Lenovo ThinkPad X300 has been published – it was put together by Michelle Thatcher. It was given a CNET Editor’s Choice for February 2008, and rated an 8.5 out of 10. 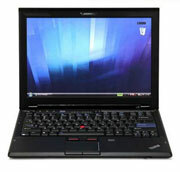 The newest addition to the ThinkPad X series incorporates the best of the MacBook Air (13.3-inch display, full-size keyboard, thickness less than one inch) with the best of the Portege R500 (solid-state hard drive, thorough selection of ports) while also adding its own great features, such as a built-in DVD burner, WWAN connectivity, and GPS. The X300’s ThinkPad DNA is evident in its instantly recognizable black, square-edged case, but at 0.73 inch thick and weighing anywhere from 2.9 pounds to 3.5 pounds (depending on your battery and optical drive choices), it’s simply the sleekest ThinkPad yet. The ThinkPad X300 should be available for ordering tomorrow. This entry was posted in LED Backlighting, Lenovo, Reviews, Solid State Drives. Bookmark the permalink.